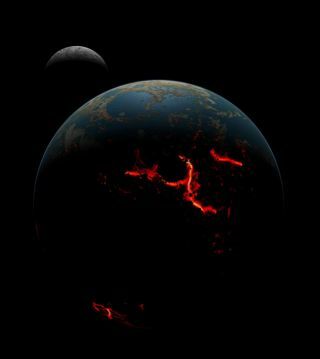 An artistic conception of the early Earth-moon system showing the Earth's surface after being bombarded with large impacts, causing magma extrusion on the surface, though some liquid water was retained. Image released on July 30, 2014. Asteroids and comets that repeatedly smashed into the early Earth covered the planet's surface with molten rock during its earliest days, but still may have left oases of water that could have supported the evolution of life, scientists say. The new study reveals that during the planet's infancy, the surface of the Earth was a hellish environment, but perhaps not as hellish as often thought, scientists added. "It was thought that because of these asteroids and comets flying around colliding with Earth, conditions on early Earth may have been hellish," said lead study author Simone Marchi, a planetary scientist at the Southwest Research Institute in Boulder, Colorado. This imagined hellishness gave the eon its name — Hadean comes from Hades, the lord of the underworld in Greek mythology. However, in the past dozen years or so, a radically different picture of the Hadean began to emerge. Analysis of minerals trapped within microscopic zircon crystals dating from this eon "suggested there was liquid water on the surface of the Earth back then, clashing with the previous picture that the Hadean was hellish," Marchi said. This could explain why the evidence of the earliest life on Earth appears during the Hadean — maybe the planet was less inhospitable during that eon than previously thought. This artist's illustration shows a close-up of the early Earth, revealing magma extrusion on the surface and the scars from severe cosmic bombardment. Image released on July 30, 2014. "We also looked at highly siderophile elements (elements that bind tightly to iron), such as gold, delivered to Earth as a result of these early collisions, and the amounts of these elements tells us the total mass accreted by Earth as the result of these collisions," Marchi said. Prior research suggests these impacts probably contributed less than 0.5 percent of the Earth's present-day mass. The researchers discovered that "the surface of the Earth during the Hadean was heavily affected by very large collisions, by impactors larger than 100 kilometers (60 miles) or so — really, really big impactors," Marchi said. "When Earth has a collision with an object that big, that melts a large volume of the Earth's crust and mantle, covering a large fraction of the surface," Marchi added. These findings suggest that Earth's surface was buried over and over again by large volumes of molten rock — enough to cover the surface of the Earth several times. This helps explain why so few rocks survive from the Hadean, the researchers said. However, although these findings might suggest that the Hadean was a hellish eon, the researchers found that "there were time gaps between these large collisions," Marchi said. "Generally speaking, there may have been something on the order of 20 or 30 impactors larger than 200 km (120 miles) across during the 500 million years of the Hadean, so the time between such impactors was relatively long," Marchi said. Any water vaporized near these impacts "would rain down again," Marchi said, and "there may have been quiet tranquil times between collisions — there could have been liquid water on the surface."